TCU had an inconsistent season under center, but still managed to emerge with a bowl victory. TCU football had expectations of competing for the Big 12 when it came into the year. Instead, the year was a true rollercoaster. Early in the year, it seemed like the Horned Frogs were in the same class as Ohio State and a streaking Texas team. That thought was put to rest, especially after quarterback Shawn Robinson was lost for the season. Instead, the Horned Frogs needed a couple miracles just to make a bowl game. Luckily, the season culminated with one of the most memorable bowl games in years, as the Horned Frogs edged out Cal to win the Cheez-It Bowl. Here’s our full postmortem and review of the 2018 TCU Horned Frogs football season. Reagor’s numbers are good, but don’t even scratch the surface of why how important he was to TCU’s offense. The true sophomore finished with 72 receptions for 1,061 yards, marks which both rank No. 2 in program single-season history. Reagor also set a record with a receiving score in seven straight games to end the year. Most importantly, he posted four all-purpose scores in the final two weeks to lead the Horned Frogs to a bowl game. With all the injuries on defense, versatility was vital. No players embodied that more than Ty Summers. The senior played linebacker and defensive end at different times throughout the season based on need. During the year, he compiled 48 tackles, 6.5 tackles for loss, four sacks and four quarterback hurries. Summers filled in when L.J. Collier was out and moved back when Garret Wallow had to play some safety late in the year. When Shawn Robinson committed to TCU, he was billed as the top quarterback recruit to ever play in Fort Worth. He had major expectations after taking over for Kenny Hill. To put it kindly, he did not come close to reaching those lofty expectations. Robinson threw for 1,334 yards and nine touchdowns in his seven starts, and added another 230 yards and three touchdowns on the ground. However, his turnover issues were so omnipresent that it cost the Horned Frogs multiple games. He posted multiple turnovers in five of six games against FBS teams. After Robinson got hurt, backup Michael Collins was unspectacular in three games before getting hurt against Baylor. One of those was an embarrassing loss to Kansas. Third-string quarterback Grayson Muehlstein was even worse. He had an amazing 27-yard, four-interception performance in one of the wildest bowl games ever. If TCU could have gotten even decent quarterback play, this might have been a Big 12 contender. Instead, it was perhaps the worst since TCU joined the Big 12. Seventeen combined points. Nine interceptions. A falling sports information director. The Cheez-It Bowl ended up being one of the most memorable games in TCU history for all the wrong reasons. The first points were scored with 4:33 left in the first quarter. After that, TCU didn’t score again until a touchdown with three seconds left in the third quarter. That was all the points in regulation. Later, the Horned Frogs intercepted a pass from Cal quarterback Chase Forrest and nearly returned it for a touchdown, but was penalized after a TCU administrator fell on the field. Jonathan Song calmly nailed a 27-yard field goal late in the game to win. But at the end of the day, it was a win. Furthermore, it was one of the most memorable games in college football. Some ranked it as the best game of bowl season. After falling to 4-6, finishing the year with a bowl win was a huge moment. 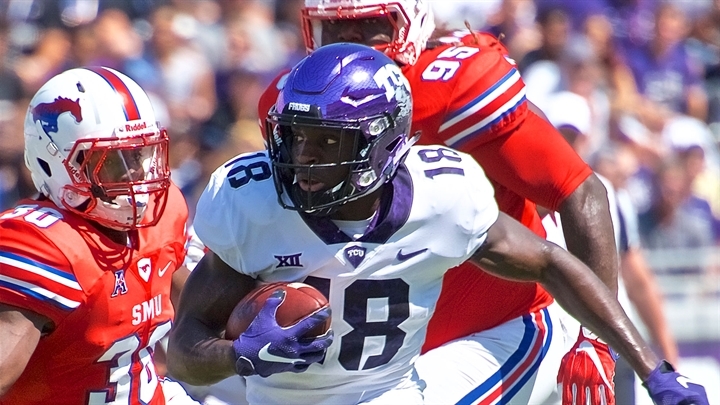 After losing Shawn Robinson to injury, TCU headed into a matchup with perennial doormat Kansas. The Jayhawks had just one other win against a Big 12 team under David Beaty, which came against the Texas Longhorns in 2016. TCU and Kansas had played overly competitive games in the past, but the Horned Frogs managed to take care of business every other time. Not this time. There wasn’t one reason that TCU couldn’t win this game. The Horned Frogs posted 500 yards of offense and held Kansas to 1.5 yards per carry. Losing the turnover battle 2-0 hurt, but shouldn’t have been enough to lose to the worst team in the Power Five. Yet, somehow, Kansas managed to send TCU to arguably its worst loss since joining the Big 12. Biggest offseason question: Where does the quarterback play come from? TCU struggled through miserable quarterback play during the 2018 season. Heading into 2019, it’s unclear whether there will be any immediate improvements. The Horned Frogs lose junior Shawn Robinson, who transferred to Missouri. That leaves them with junior Michael Collins, redshirt freshman Justin Rogers, true freshman Max Duggan and Kansas State grad transfer Alex Delton. Delton is the only player who has played multiple years at the FBS level, and he wasn’t particularly encouraging under Bill Snyder. 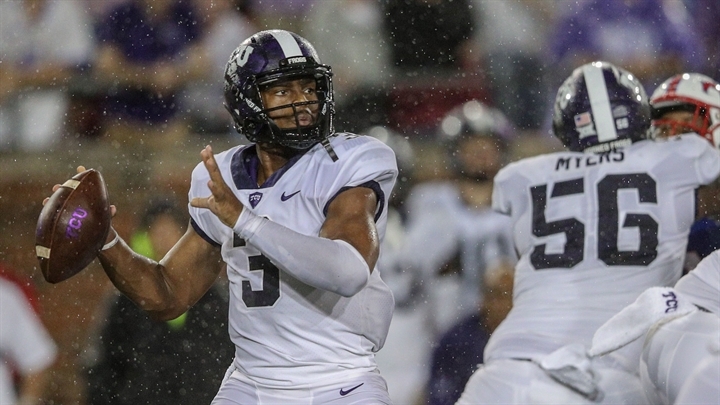 Collins played alright when he was inserted as the starter, but TCU went 1-2 in those games. Rogers is still recovering from nerve damage in his lower body, and Duggan has only played against local Iowa competition. There isn’t an obvious savior on the roster, but there are options. TCU will have to hope that one of these players can develop more than expected or the ceiling will be firm. How do you possibly grade this team? The Horned Frogs were picked to finish No. 3 in the Big 12. Instead, it took some miraculously play just to make a bowl game. That still ignores plenty of context. We realized early on that this offense was not ready. The quarterback play was as bad as any team in the Power Five, not even counting that the Horned Frogs had to cycle through three different quarterbacks. Once Shawn Robinson and Michael Collins got hurt, Gary Patterson coached some of the best games of his life. With such incredible highs and terrifying lows, it’s hard to establish what fair criteria are to evaluate this team. TCU did not meet expectations. But in a funny way, this team squeezed every bit of production out of its roster. That’s worth something.